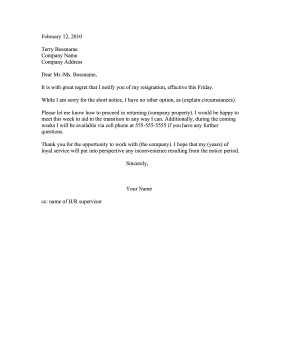 Be apologetic about an abrupt departure with this short notice resignation letter. It is with great regret that I notify you of my resignation, effective this Friday. While I am sorry for the short notice, I have no other option, as (explain circumstances). Please let me know how to proceed in returning (company property). I would be happy to meet this week to aid in the transition in any way I can. Additionally, during the coming weeks I will be available via cell phone at 555-555-5555 if you have any further questions. Thank you for the opportunity to work with (the company). I hope that my (years) of loyal service will put into perspective any inconvenience resulting from the notice period.